Founded in 1995, SANCON Electronics is one of the leading and largest manufacturers of electrolytic capacitors in China, which has completely in-house production cycle. The company offers not only aluminum electrolytic capacitors and films, but also creates the whole equipment used for the product range manufacturing. Currently it has more than 450 skilled workers and fully automated equipment including 93 production lines located in a factory of 25.000 m2. The modern technologies, equipment and management style are all acquired by Japan, the company complies with ISO 9001: 2008 guidelines for quality management. SANCON conforms to SGS certificate, ISO 14001, ISO 11439: 2013 and has succesfully applied ISO 9002 management system, where operates in 5- steps to ensure the smooth production. Thanks to all this, SANCON got the capacity to produce 1 billion capacitors annually and it is a well-known brand for electrolytic capacitors on markets such as USA, Australia, Europe, Asia and Africa. Company's catalog includes: 50 series of quality aluminum electrolytic capacitors (standard, wide temperature range, miniature, high voltage, axial and others.) and suitable electrode foils. SANCON products are widely used in household appliances, computers, automotive and IT industry, telecommunications equipment and consumer electronic products. 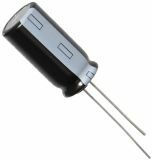 SANCON aluminum electrolytic capacitors are available in different sizes and have a longer life, high capacity, low resistance, high heat resistance and high voltage. They are widely used in computer peripherals, power supplies, consumer electronic products, car audio products, lights and automatic products. SANCON Electronics cooperates with more than 150 clients worldwide, including Samsung, LG, Hyundai and Hisense. VIKIWAT Ltd. is an exclusive representative of SANCON Electronics for Bulgaria. As a direct importer and a wholesaler, VIKIWAT offers a variety of electrolytic capacitors with SANCON brand on stock, flexible conditions for wholesale orders and fast delivery. List Price 1.90лв. VAT Incl. 1.81лв. VAT Incl. 1.71лв. VAT Incl. 1.61лв. VAT Incl. Electrolytic Capacitor 10uF, 16V, THT, Ф5x12mm Electrolytic Capacitor with voltage 16 V, capacitance 10 uF and operating temperature 105°C. List Price 0.08лв. VAT Incl. 0.07лв. VAT Incl. 0.06лв. VAT Incl. 0.05лв. VAT Incl. Electrolytic capacitor 10uF, 25V, THT, Ф5x12mm Electrolytic capacitor with an operating voltage of 25 V, 10 uF nominal capacity and operating temperature 105 °C. List Price 0.09лв. VAT Incl. 0.08лв. VAT Incl. 0.07лв. VAT Incl. 0.06лв. VAT Incl. Electrolytic Capacitor 10uF, 35V, THT, Ф5x12mm Electrolytic Capacitor with voltage 35 V, capacitance 10 uF and operating temperature 105 °C. List Price 0.10лв. VAT Incl. 0.09лв. VAT Incl. 0.08лв. VAT Incl. 0.07лв. VAT Incl. List Price 0.08лв. VAT Incl. 0.06лв. VAT Incl. 0.05лв. VAT Incl. Electrolytic capacitor 10uF, 63V, THT, Ф5x12mm Electrolytic capacitor with an operating voltage of 63 V, 10 uF nominal capacity and operating temperature 105 °C. Electrolytic capacitor 10uF, 350V, THT, Ф10x17mm Electrolytic capacitor with an operating voltage of 350 V, 10 uF nominal capacity and operating temperature 105 °C. Electrolytic Capacitor 10uF, 450V, THT, Ф13x21mm Electrolytic capacitor with voltage 450 V, capacitance 10 µF and operating temperature 105 °C. 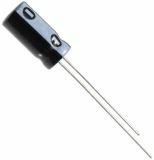 Electrolytic capacitor 22uF, 16V, THT, Ф5x12mm Electrolytic capacitor with an operating voltage of 16 V, 22 uF nominal capacity and operating temperature 105 °C. 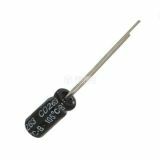 Electrolytic Capacitor 22uF, 25V, THT, Ф5x12mm Electrolytic Capacitor with voltage 25 V, capacitance 22 uF and operating temperature 105 °C. Electrolytic Capacitor 22uF, 35V, THT, Ф5x12mm Electrolytic Capacitor with voltage 35 V, capacitance 22 uF and operating temperature 105 °C. Electrolytic Capacitor 22uF, 50V, THT, Ф5x12mm Electrolytic Capacitor with voltage 50 V, capacitance 22 uF and operating temperature 105 °C. 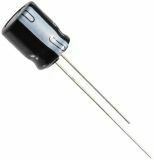 Electrolytic capacitor 22uF, 63V, THT, Ф6.3x12mm Electrolytic capacitor with an operating voltage of 63 V, 22 uF nominal capacity and operating temperature 105 °C. List Price 0.15лв. VAT Incl. 0.13лв. VAT Incl. 0.12лв. VAT Incl. 0.11лв. VAT Incl. Electrolytic Capacitor 22uF, 160V, THT, Ф10x16mm Electrolytic Capacitor with voltage 160 V, capacitance 22 uF and dimensions Ф10x16 mm. 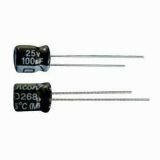 Electrolytic Capacitor 22uF, 350V, THT, Ф13x21mm Electrolytic Capacitor 350 V, 22 µF, Ф13x21 mm. Electrolytic Capacitor 33uF, 16V, THT, Ф5x12mm Electrolytic Capacitor with voltage 16 V, capacitance 33 uF and operating temperature 105 °C.